The research report on the global rare disease treatment market focuses on the various trends, opportunities, challenges, and growth drivers across the different segments present in the market. The report covers a global perspective analyzing the most important regions of North America, Latin America, Europe, Asia Pacific (APAC) and Middle East and Africa (MEA). This provides a global view of the market covering all the key areas and presents a holistic view of the market. This can enable the reader to list out regions with optimum potential in order to slate investment decisions and expansion strategies. The research study eliminates all the biasness giving a more accurate shape to the market numbers. The data mining done to get a clear understanding of the market involves all sorts of number crunching thereby chalking out a detailed statistical market report. The global rare disease treatment market research report covers all the angles by including a robust segmentation of the entire market. This ensures no aspect is left behind and a more real picture of the market can be drawn. The research methodology used to carry out the market analyses, data mining, number crunching, statistical analyses etc., is unparalleled and delivers near 100 percent accurate results. A secondary research is initially carried out to understand the global market based on which the market definition is stated. Obtaining a high overview of the market is just one step. The primary aspects of the research process applied at Persistence Market Research include re-validation and re-evaluation of the data collected. Primary interviews are carried out to help in cross verification of the data points at each step, establishing good accuracy percentage in each data point, and the re-validation ensures that the most accurate data is presented to the reader. The expert opinions of the market observers and domain experts is extrapolated and triangulation of these enables the analysts to arrive at a data stream that is an accurate representation of the global market. This comprehensive research report on the global rare disease treatment market provides valuable insights with in-depth analyses to the reader. Persistence Market Research aims at doing all the heavy lifting and providing actionable insights that can be utilized by clients to add more value to their business acumen and objectives. The global rare disease treatment market report comprises a separate section focusing on the key players and the competition standing in the global market. This section presents the strategies applied by the key players, their product portfolios, their innovations, developments and product evolutions, their area wise spread and future expansion plans, the mergers and acquisitions, the market shares and revenues of these tier players, financials, key personnel, and other useful information. This intelligence dashboard ends with the inclusion of an analysis of the various aspects of the competitive ecosystem. The main aspects that add value to the report are – an unbiased data collection process; comprehensive five level segmentation of the entire market; analysis of the key trends and developments taking place in the market; statistical analyses reaching maximum accuracy; and global market forecasts that give an idea about the future market scenario based on the current and the past market dynamics. These assist the client in slating important strategies in order to maintain the right tempo and overcome the challenges caused by the changing market dynamics to achieve competitive advantage. The rare disease treatment market covers a detailed segmentation in which the genetic diseases segment is poised to grow at a moderate pace and stay a dominant segment by therapeutic area. Almost 80 percent diseases are of genetic origin. The genetic segment is poised to reflect a significant US$ 56 Bn market valuation by the end of 2025, as per the market forecasts gathered in this research report. Following the genetic diseases segment, the oncology segment is expected to be the runner up with regards to market share analysis with a comparatively low growth rate than the genetic diseases segment. The metabolic diseases segment is expected to show the highest growth rate to reflect a CAGR of 14.2% during the forecast period of 2017 to 2025, followed by the neurological diseases segment at 11.3% CAGR. North America is projected to remain the largest regional market for rare disease treatment during the period of forecast 2017-2025 with an estimated market share of almost 40% by the end of 2025. This region is expected to retain its dominance in the coming years. As far as therapeutic area is concerned, the North America rare disease treatment market is dominated by the genetic diseases segment, and is poised to grow at a robust CAGR of 8.5% during the forecast period. The metabolic diseases segment by therapeutic area also shows higher potential growth rate in the North America region during the period of forecast. The primary reason for the region to project dominance is the prevalence of a well-established healthcare system as well as several reimbursement policies to organize treatments for patients suffering from rare diseases. The genetic diseases treatment segment in the North America regional market is expected to be a lucrative segment during the 2017-2025 forecast period with an attractive market share index of 4.2. The global rare disease treatment market is impacted by several factors that directly or indirectly affect the growth of the market. 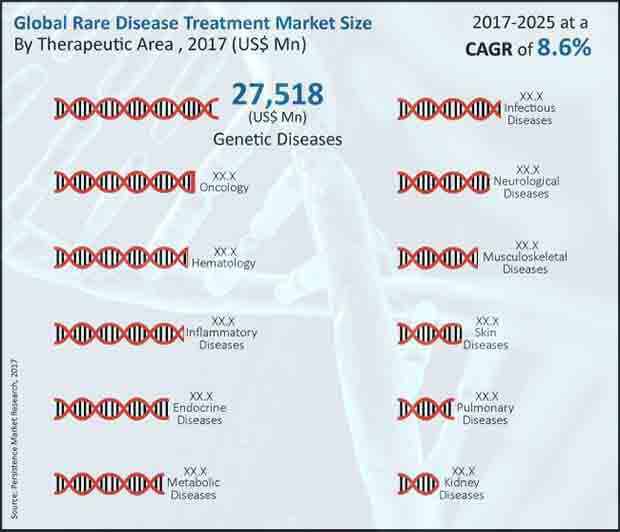 According to our research report on the rare disease treatment market, the global market is poised to reflect a market valuation of US$ 198,487 Mn in 2025 and exhibit a CAGR of 8.6% during the period of forecast. There are various factors that are responsible for the growth of the rare disease treatment market and are analyzed in this research report along with their impact few years down the line. The report highlights the different push factors of the global rare disease treatment market such as increasing government assistance, provision of incentives to pharmaceutical companies, increasing awareness among people and social groups, the physician to physician communication to find efficient treatment methods to treat rare diseases, increase in facilities for patients affected by rare diseases, rise in the incentives for research owing to the prevalence of non-profit organizations that promote health to treat rare diseases, other government incentives and regulations such as reduced tax on pricy medicines, higher funding on the research on rare diseases and their treatments, promising regulatory assistance along with the advantage of monopolistic market etc., which contribute to the growth of the global rare disease treatment market. There are few other factors that pull the growth of the global market, such as the challenges in the research and development, delay in diagnosis thereby delaying the treatment, limitations with respect to expertise, characteristic lack of attractiveness from an economic standpoint, which eventually has resulted in the scarce commercial interest for private investors, lack of regulatory framework in developing economies coupled with lack of skilled healthcare personnel.